You don’t have to stay home or hide in a corner at parties. There is a solution for you—porcelain veneers. 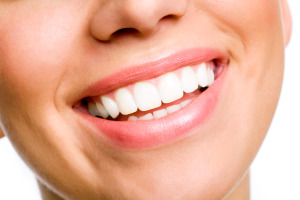 Haddon Family Dentistry is the premier dental office for porcelain veneers in Haddonfield. Veneers are very thin pieces of durable, tooth-shaped porcelain that are custom made for you. They are bonded onto the front of your teeth to create a bright, beautiful, and attractive smile. They are scratch resistant, stain resistant, and do not change color over time. Usually, two visits are all that is required once you decide to proceed with veneers. First, your teeth are prepared by lightly buffing and shaping the surface. A mold or impression of the teeth is taken and a shade of color is determined. On your second visit your teeth are cleansed with special liquids to achieve a durable bond. Bonding cement is then placed between the tooth and veneer and a special light beam is used to harden and set the bond. While veneers are very durable and likely last many years, as with most dental restorations, they are not permanent and may someday need replacement. Of course, proper brushing, flossing, and regular dental visits will aid in the life of your new veneers. Haddon Family Dentistry can provide you with detailed information about porcelain veneers and how they can improve your overall dental well-being. We are conveniently located in Haddonfield apart of Haddon Township near Westmont, Collingswood, and Cherry Hill. If you have questions about porcelain veneers, please call us, we would love to talk to you! "We are new patients & big fans of this office - Dr. Dworak, his assistant, and Rachel are all so wonderful! My mother was so impressed and so pleased and so was I! Will be sending family & friends your way! Many thanks!" "Thanks for getting me in last minute! Dr. Dworak is SO gentle and does a great job. Doesn't hurt that his staff is extremely sweet too. Thanks again." "Simply stated, Haddon Family Dentistry is the best!!!!" "I had the best experience today, for my first visit at Haddon Family Dentistry." "Thank you! Thank you! Thank you! You made today's trip well worth it and totally painless! I will definitely be back to start the process on regaining a healthy mouth!"